Dimensions: 17" x 7.9" x 17.7"
With nearly half-century history and advanced production techniques, Silentaire Technology takes air compressors to a whole new level of noiseless, economic yet powerful airbrush operation. The company works to design quality, efficient products and supply customers with devices they really need. 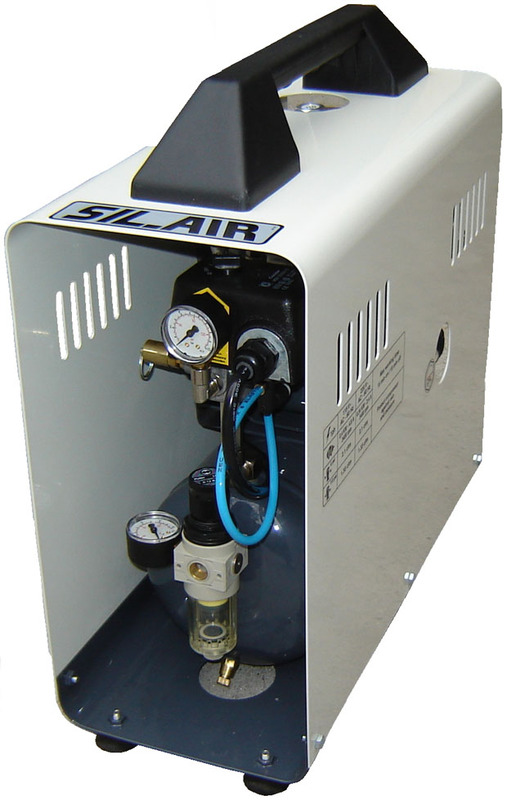 To do so, the manufacturer produces several lines of compressors that are able to meet all of the different needs of airbrush users. While developing air compressors, the technical and economic aspects are not the only things considered. For their professionals, it is also crucial to create compressors that will make airbrushing a comfortable and enjoyable process. carrying handle or wheels allowing for extra portability. For the efficiency and safety of compressor operation, it's recommended to follow a duty cycle of 15 minutes running to 15 minutes cooling down. This helps to prevent overheating and increase in the oil consumption as well as to prolong the compressor's service life. Also, do not forget about the periodic maintenance specified in the user manual. In doing so, you ensure the correct work of the device and helps extend its lifespan. In addition to the compressor, the packing includes an oil bottle type ROLOIL - SINCOM/32E, instruction manual, and a tank certificate. The Silentaire Sil-Air 50-9-D Compressor includes a guarantee that is valid for a period of 12 months from the date of purchase. Note that this guarantees you only free repair or replacement of parts which are defined by the manufacturer as defective. In case, there was any tampering or bad usage, the guarantee will be considered invalid. We are also bringing to your attention, that the guarantee doesn't cover the replacement of the electric parts and worn parts. 23" x 22" x 21"